Christmas season in Italy is traditionally celebrated from December 24 January 6, or Christmas Eve through Epiphany, which is often referred to as the Twelve Days of Christmas. If you're traveling to Italy during this festive season, you're certain to run into a variety of special events, celebrations, and holiday markets throughout the country. Celebrating Christmas for 12 days follows the pagan season of celebrations that started with Saturnalia, a winter solstice festival and ended with the Roman New Year, the Calends. However many events start on December 8, the Feast Day of the Immaculate Conception, and you'll sometimes see Christmas decorations or markets even earlier than that. No matter why or when you want to start celebrating Christmas this year, you're sure to find something to put you in the holiday spirit on your trip to Italy in late December or early January. Babbo Natale (Father Christmas, or the equivalent of Santa Claus) makes the rounds on the night before Christmas, but another important day for gift-giving is Epiphany on January 6. It's the 12th day of Christmas when the three Wise Men gave Baby Jesus their gifts. In Italy, presents are brought by a friendly old witch named La Befana, who arrives in the night to fill children's stockings. Christmas trees, lights, and decorations are often seen starting around December 8, the Feast Day of the Immaculate Conception, or even the end of November. The main focus of decorations continues to be the presepe, a Nativity scene or creche. Almost every church has a presepe, and they are often found outdoors in a piazza or public area, too. Traditionally, a fish dinner is eaten on Christmas Eve with the family, followed in many places by a living nativity scene and midnight mass. Traditional bonfires are often held on Christmas Eve in the main square of the town, especially in mountain areas. Dinner on Christmas day is usually meat-based. Trento: Starts near the end of November and lasts all December long. The market includes more than 60 traditional wooden huts selling a variety of crafts, decorations, and food in Piazza Fiera. A large Nativity Scene is created in Piazza Duomo, too. Bolzano: Daily market from the end of November through December 23 selling crafts and decorations in the historic center of town. Trieste: A week-long holiday market in northeastern Italy's Friuli-Venezia Giulia region known as Fiera di San Nicolo, which takes place the first week of December. The market sells toys, candy, and Christmas items. Pordenone: A daily holiday market from December 1 to Christmas Eve that's also located in the Friuli-Venezia Giulia region. Bologna: A Christmas market held in the historic Bologna town center from late November through early January. Genoa: A week-long Christmas and winter fair held in early December with exhibitions of arts and handicraft products and other items for sale. Frascati: A wine town in the Castelli Romani south of Rome that holds a traditional Christkindlmarkt from December through January 6, with many stands open during the day until 9:30 pm. Florence: A German-style Christmas market at Piazza Santa Croce with many booths from the end of November to a few days before Christmas. Lucca: a Christmas market in Piazza San Michele, located on the Versilia Coast, which usually runs through December 26. Perugia: a Christmas market is held in the Rocca Paolina for three weeks in December. Sorrento: A Christmas market held in the main square on the beautiful Amalfi peninsula in the Bay of Naples through January 6. Syracuse: A two-week Christmas Fair in Sicily starting the first or second weekend of December. Cagliari: A Christmas Fair in Sardinia held for two weeks in December with traditional crafts, food, and wine. Other Christmas fairs and markets are listed below in cities that also host larger events or attractions in honor of the holiday season. Although almost every major city in Italy has some sort of Christmas market this year, only a few communities come together to build an entire Christmas village for guests to enjoy: the Campo Santo Stefano neighborhood of Venice and the Wonderland Village in Milan. Campo Santo Stefano transforms into a delightful holiday town in December each year with wooden houses set up in the piazza and stalls selling high-quality Venetian handicrafts. There's also regional food, drink, and music available throughout the month, and a number of special events that will take place during the Twelve Days of Christmas. Milan also hosts a special Christmas village known as Wonderland Village in the historic town center from early December through January 6 with a market, ice-skating rink, and entertainment. Additionally, once the village closes for the season, you can head to Oh Bej, Oh Bej—a big market with several hundred stalls held near Castello Sforzesco—on December 7 and a few days before or after. Unlike other cities in Italy, Rome has its own unique set of Christmas traditions it celebrates in December and January each year. Along with a large holiday market, the city also plays host to several ornate nativity displays and giant Christmas trees decorated in festive lights. Rome's Piazza Navona hosts a big Christmas Market, though it's heavy on cheap souvenirs. Throughout the market season, Babbo Natale will make appearances for picture taking opportunities and there will be a life-size nativity scene set up in the piazza later in December. For Christmas trees, you can stop by the city's central Saint Peter's Square for the largest of the bunch alongside a life-sized nativity scene that's usually unveiled on Christmas Eve. Other large trees can be found at the Piazza Venezia and next to the Colosseum, both of which provide excellent photo opportunities for your holiday trip abroad. If you're looking for the best place to witness a traditional Roman Catholic mass for the Christmas holiday, there's no better place than Saint Peter's Square in Vatican City to catch these special religious ceremonies. Saint Peter's Square hosts the popular midnight mass given by the Pope inside Saint Peter's Basilica, and those in the square get to see it love on a big-screen TV. Additionally, At noon on Christmas Day, the Pope gives his Christmas message from the window of his apartment overlooking the square, where a large tree and nativity scene are erected before Christmas. Naples is one of the best cities to visit for Nativity displays. Naples and southern Italy have other Christmas traditions, including the Christmas Eve dinner of the seven fish dishes, although it doesn't really have to be seven fishes—oftentimes it's more—and not everyone serves it. Bagpipe and flute players, zampognari and pifferai, are a part of Christmas celebrations in Rome, Naples, and southern Italy as well. These performers often wear traditional colorful costumes with sheepskin vests, long white stockings, and dark cloaks. Many of them travel from the mountains of the Abruzzo region to play outside churches and in popular city squares. Naples also holds a December Christmas market near Via San Gregorio Armeno, known for its many nativity workshops. For the Christmas market, some vendors dress in traditional shepherd costumes as well. 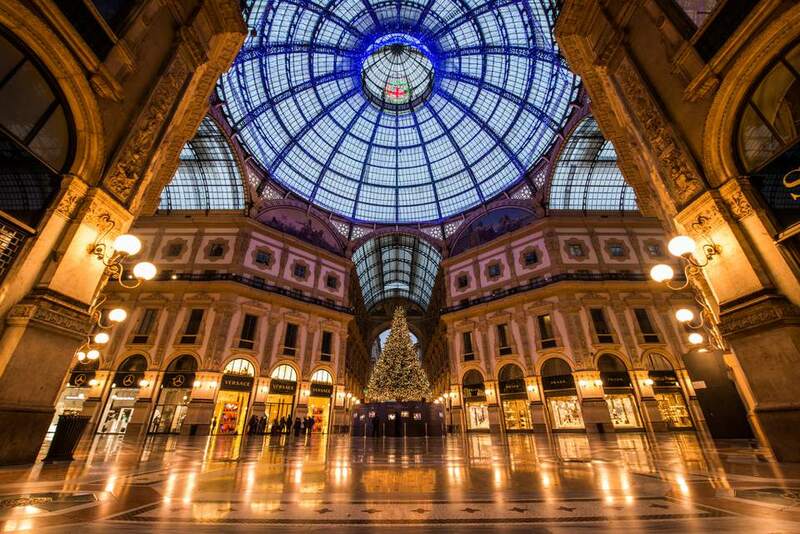 Torino, in northern Italy's Piemonte region, is one of the best places to see the region's rich Italian architecture decorated in bright holiday lights. More than 20 kilometers of streets and squares are illuminated by some of the best light artists in Europe from late November through early January for the annual holiday lighting displays across the city. Torino also holds a Mercatino di Natale during December in the Borgo Dora area. Stalls selling a variety of merchandise are open all week and on the weekends there's music and entertainment for children. Verona, the city of "Romeo and Juliet," is decorated with hundreds of lights throughout the month of December and into early January each year. An illuminated arch with a huge star points to the Christmas market, and there will also be a life-sized nativity scene displayed in the Roman Arena throughout the season. In addition, the city of Verona holds a huge German-style Christmas market in Piazza del Signoria with wooden stalls selling handicrafts, decorations, regional foods, and German specialties, which usually starts in late November and runs through December 26. The Umbria region of Italy is full of Christmas festivities starting in early December and continuing through the first of the new year. From a giant Christmas tree atop a mountain to a unique nativity scene powered by the sun, this gorgeous region of the country makes an excellent destination for your holiday travels. For a chance to see a one-of-a-kind view and one of the largest Christmas trees in the country, you can head to Monte Ingino, above Gubbio in central Italy's Umbria region, which is home to a 650-meter tall tree decorated with over 700 lights. The tree is topped by a star that can be seen for nearly 50 kilometers, which is turned on every year on December 7, the evening before the feast of the Immaculate Conception. In Città di Castello, you can celebrate Christmas Eve on the Tiber River, where a group of canoeists dressed as Father Christmas makes their way to the bridge at Porta San Florido in light-covered canoes. When they get out of their canoes after going under a cradle suspended from the bridge, each Father Christmas canoeist will give small presents to the children gathered there. Additionally, you can head over to Lago Trasimeno throughout the month for the Trasimeno Blues Festival, which features a performance called "Soul Christmas" on various dates from December 8 to 31, 2018. Alternatively, you can stop by Manarola in Cinque Terre to see its] unique ecological nativity powered by solar energy. The Festival of Nemoralia, commonly known as the Festival of Torches, was celebrated by ancient Romans in honor of Diana, goddess of the hunt and moon, but was later adopted by Catholics as The Feast of the Assumption. Various cities throughout Italy celebrate modern Catholic and ancient Roman traditions alike with Festival of Torches events. In Abbadia di San Salvatore, near Montalcino, the Fiaccole di Natale or Festival of Christmas Torches is celebrated on Christmas Eve with carols and torchlight processions in memory of the shepherds from the first Christmas Eve. Cortina d'Ampezzo in the Alps, on the other hand, celebrates this religious holiday with a skiers torchlight parade at midnight on Christmas Eve. During this dazzling yet bizarre event, hundreds of people ski down an Alpine peak carrying torches to celebrate the winter season.